Download our Saint Ouen Flea Market Map right here. Bargain hunters aren’t the only ones who should be excited about our Saint Ouen Flea Market map! Forget the souvenir shops in Paris that are really just tourist traps in disguise. Wouldn’t it be better to get something that’s guaranteed to be uniquely yours? Only something from the flea market can fulfil that promise. We’re introducing you to Paris’ best and biggest flea market, all the way in the northern border of the city, Saint Ouen. 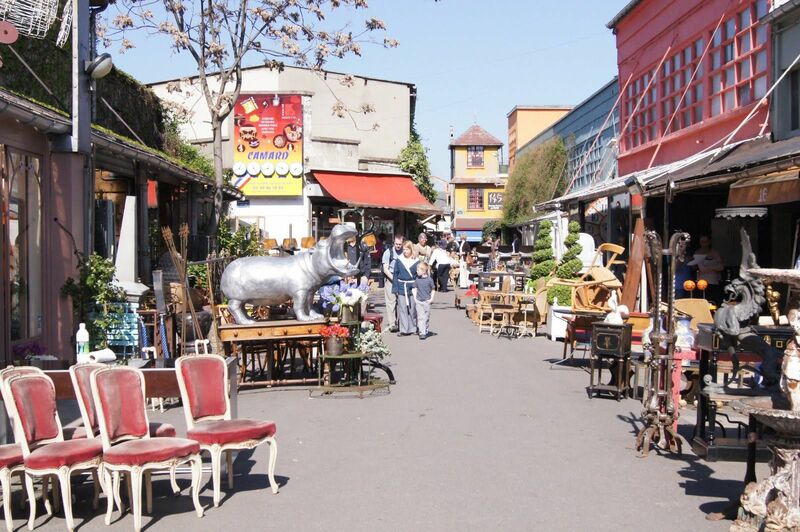 Saint Ouen flea market dates back to 1920 and is spread out in 7 large hectares and 15 markets. It seems a lot but our map has already done the hard work for you. We’ve already filtered out the markets that are the least worth visiting and instead, we have highlighted the 5 best ones. After your trip to Saint Ouen, you’ll never want to visit a generic souvenir shop again! 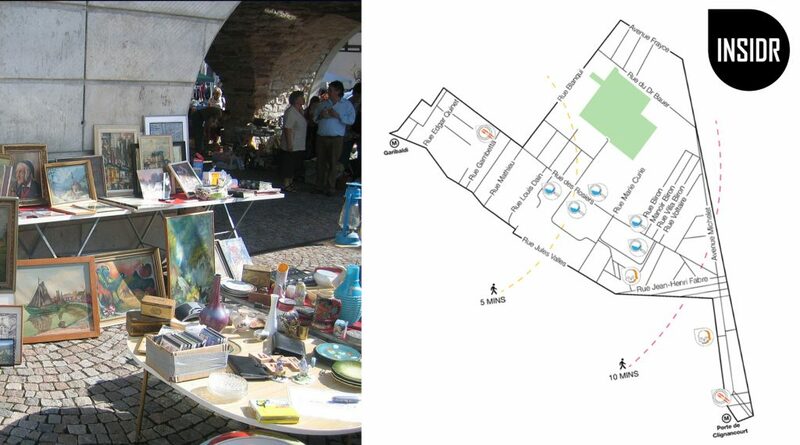 What is in your Saint Ouen Flea market map? 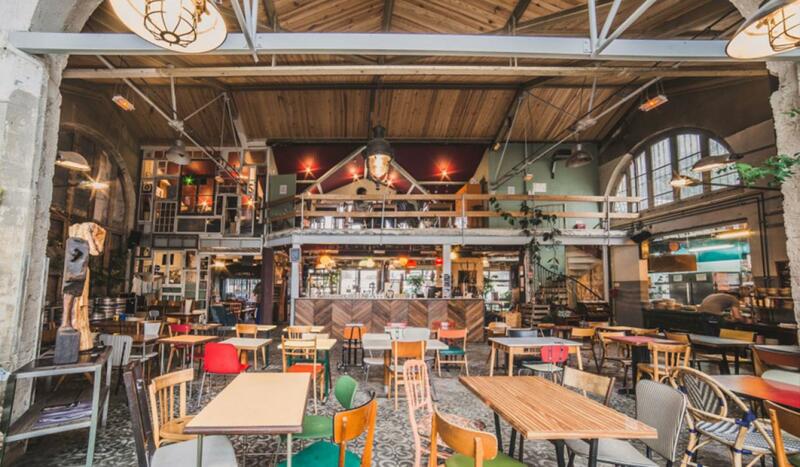 10+ recommendations of the must-visit spots in Saint Ouen flea market, including the best markets and restaurants in the area. Les Puces de Saint Ouen is the most famous place for bargain shopping in Paris. This is where over 1,700 local merchants offer furniture, homeware, bric-a-brac, and art pieces for sale. It is vast and so consequently, you might feel overwhelmed by everything that’s going on. To help with that, we’ve marked down in our Saint Ouen flea market map the best marchés in Saint Ouen. You’ll find that the markets here aren’t directly competing with each other. Instead, every market specializes in particular kinds of antiques and goods. Also you can all our best Paris local INSIDR tips on our visit Paris travel guide. Marché Paul Bert Serpette is the flagship of the famous Puces de Paris Saint-Ouen and is the world’s largest antique market. This is where serious antique hunters go whether it is for expanding your collection or for reselling them back in your own shop. You’ll find everything here period pieces of furniture and funky jewellery as well as vintage designer clothing. It is said that the market draws in an average of 5,000 visitors each weekend so be prepared to put up your best offers! Marché Biron has arguably been nicknamed as the “Faubourg Saint-Honoré” of the Paris flea market because of the prevalence of high quality design furniture the market has. Biron market has the reputation of being the key market hub with top-of-the-range merchandise dating from the eighteenth, nineteenth and twentieth centuries attracting well-known customers. Come here with a full wallet if you’re hoping to bring anything with you home. Marché Dauphine is the go-to market in Saint Ouen for great furniture and decorative pieces that aren’t quite the bank-breakers like the ones you’ll find in Biron. You’ll also find comics, CDs, books, and old films in the mix! If you’re not looking to buy anything, entertain yourself in the market by Dauphine’s contemporary art gallery. Marché Malassis focuses on 20th century pieces from the 1930s, 1950s, and 1970s. 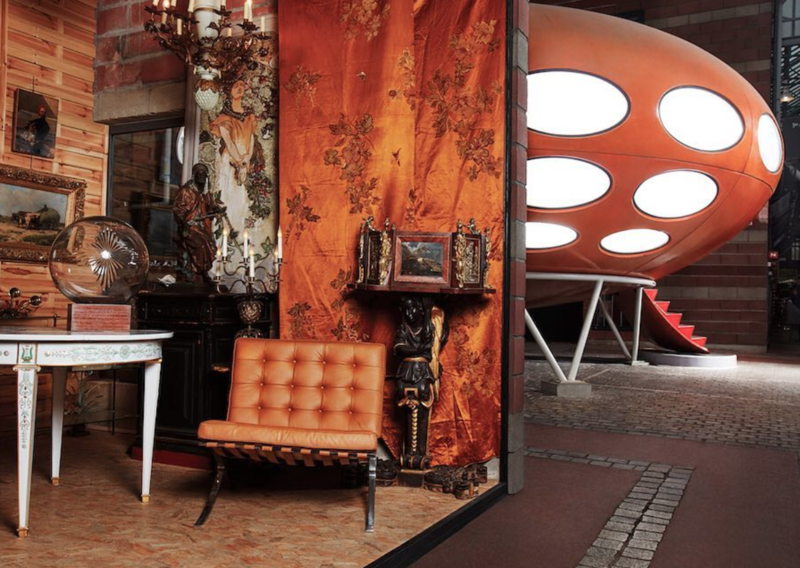 The market is indeed a treasure trove of a range of contemporary antique and retro goods. At this market is where you’ll find oriental homeware and vintage fashion and accessories. Get your Paris Flea Markets Map right here! The Saint Ouen flea market is bordering the northern suburbs of Paris. Before you roll your eyes and assume that nothing in the area is worth stopping for a bite, have a look at our suggestions. They might just surprise you! 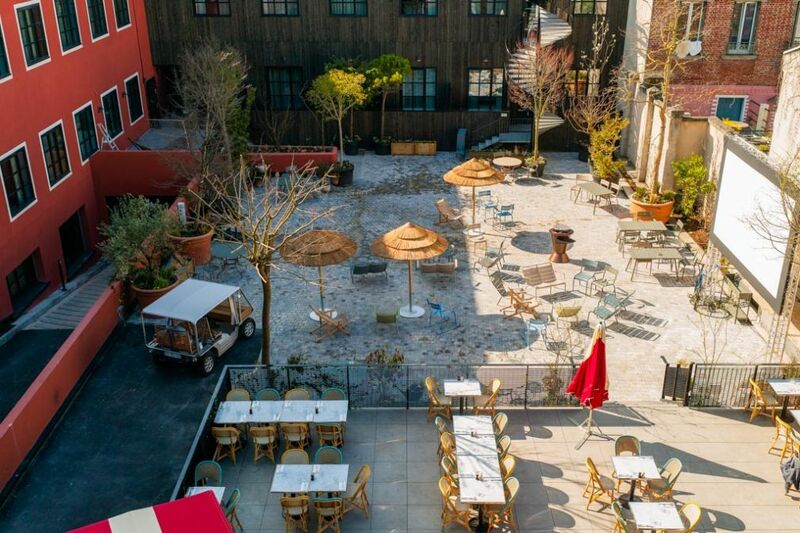 Mob hotel is a massive property just a few minutes away on foot from the Saint-Ouen Flea Market. The hotel may be very far from the center of Paris like where most accommodations are, but it certainly impresses with its smart architecture and community-based ethos. The reasoning behind the entire establishment is evident even in the food served at the restaurant which defends “local, cooperative and fully organic agriculture“. We’re fans of the mediterranean dishes on the menu! Also nearby in the area is probably the best representation of when vintage and second-hand items for sale come together: La RECyclerie. The people behind this restaurant/bar/farm/garden are geniuses invested in bringing places, which were once thought hopeless, back to life. The food here is very humble and gets inspiration from ethnic flavors and you can trust that its organic. Come here after bargaining your way through the flea markets or simple just come here to support a good cause. 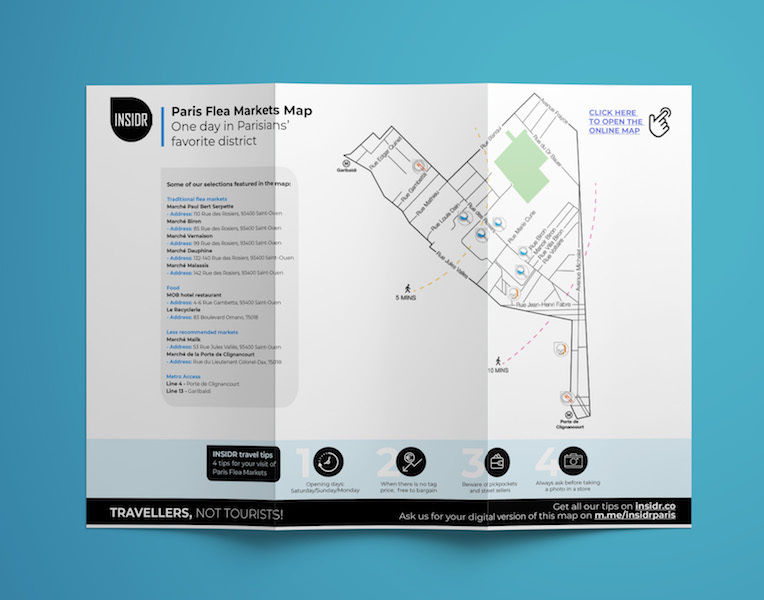 You liked our Saint Ouen Flea Market map? There are more free INSIDR Travel resources for you! We’ve published a few other free guides that will help you make the most out of your time in Paris! Our Paris Museums Guide will tell you about the best museums and exhibitions in Paris right now. We’ve got the Paris Shopping Guide that is full of information on where to shop in Paris for specific things you’re looking for. 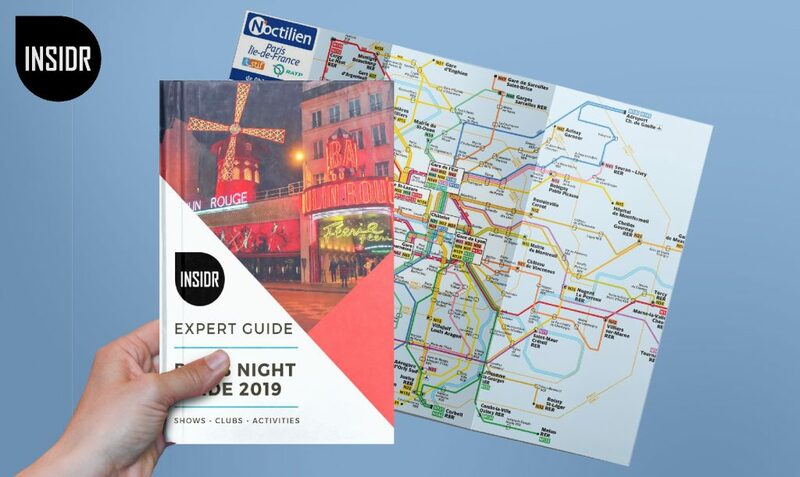 The Paris Night Guide show you a great list of restaurants, bars, clubs, and entertainment venues all over the city!